In 1885 the Imperial British East Africa Company was founded to administer British East Africa after the Berlin partition of Africa. The dominant currency trading within the Indian Ocean Coast then was the Indian Rupee, a currency which had been in circulation in India from as far back as the 6th century BCE. 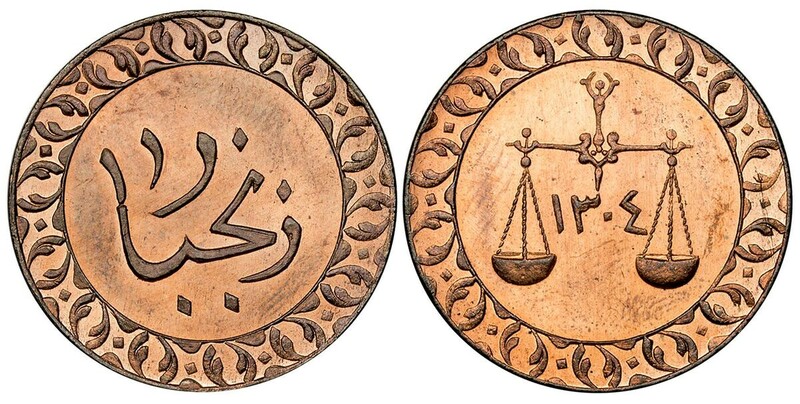 The Indian RUPEE, RUBIYA, was divided into sixteen ANNAS and the ANNA into four PAICE. 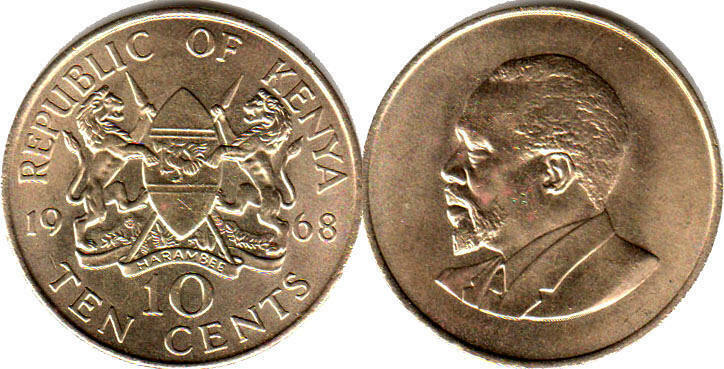 The Sultan of Zanzibar who had control of the East African Coast had his own currency called PYSA. It is therefore much more likely that the word PESA in Swahili, an East African Coast Language, could have been derived from either Pysa or the Indian Paice than from a much later and rarer Pace as proposed by the Central Bank of Kenya website. The Gikūyū word for money, Mbeca is derived from the Kiswahili, Pesa. 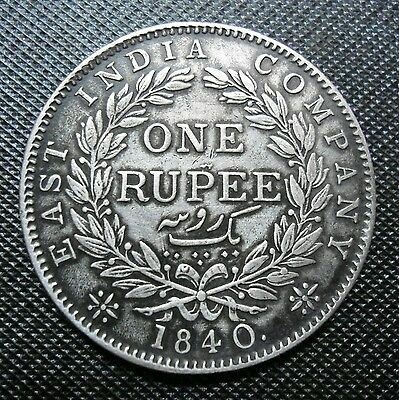 The IBEA company on arrival issued its own Rupee and Anna based on the Indian equivalent and stamped them, MOMBASA to distance themselves from the Sultan’s capital Zanzibar. German East Africa, later to become Tanzania was using its own RUPIEN and Dutch HELLER. 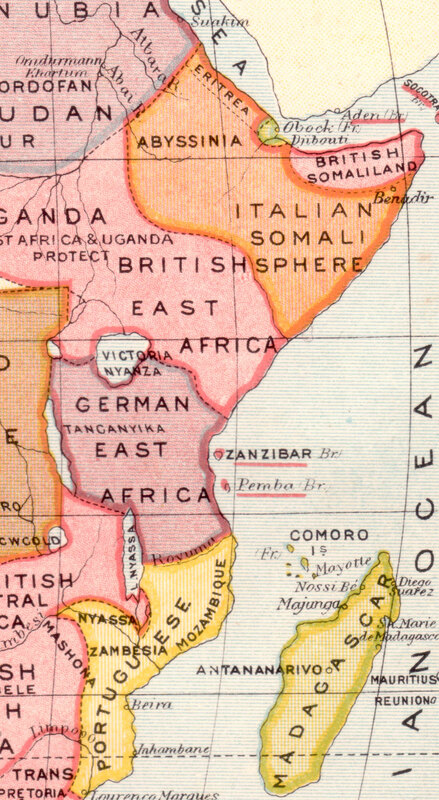 In 1895 an East Africa Protectorate was proclaimed by Britain over the East African territories agreed upon in the Berlin treaty then controlled by the Imperial British East Africa Company. 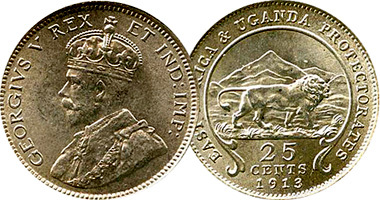 In 1897 Harry Jackson for the Protectorate introduced the PICE but it failed to make any impact as the Rupee, Rubiya, in Gikuyu had already taken root. The PICE was promptly withdrawn in favour of the RUPEE. 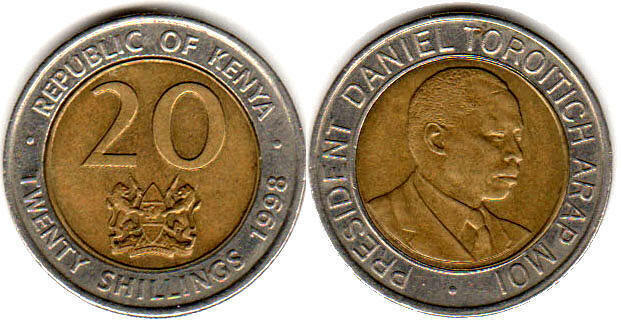 The following are the names of the coins that have been used and dates of the coins that have been issued in Kenya so far. ½ CENT. 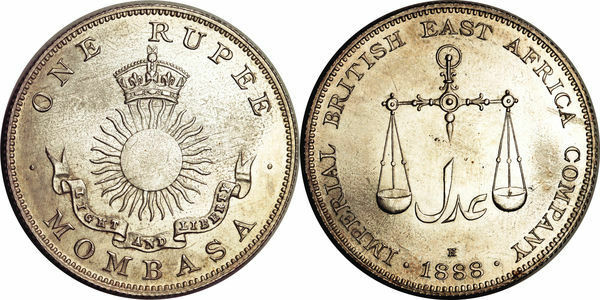 1908 – 1909 A short lived coin that was issues by the British Protectorate. 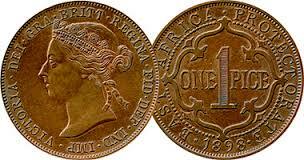 The low denominations up to ten cents had a hole in the middle to allow Africans to pass a string in them and hang them, usually on their necks. 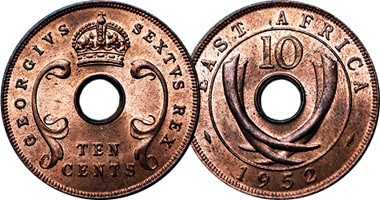 1 CENT (Hera) 1907 – 1962 No post-colonial issue. 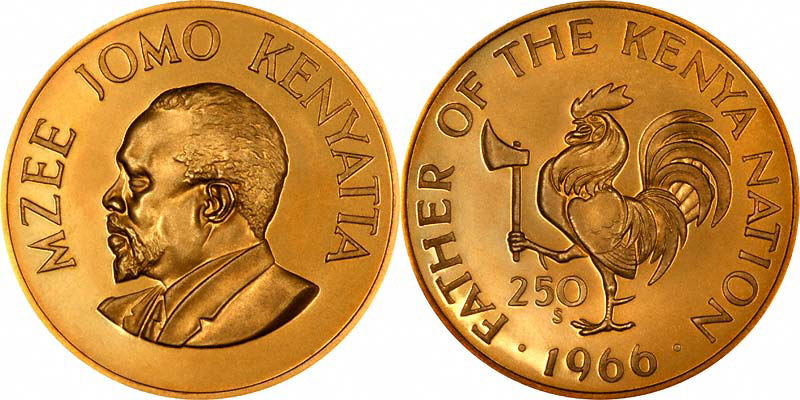 When the Gikuyu people saved 8 Hera coins tied together, the eight were referred to as Rubeca, a locally agreed upon denomination. 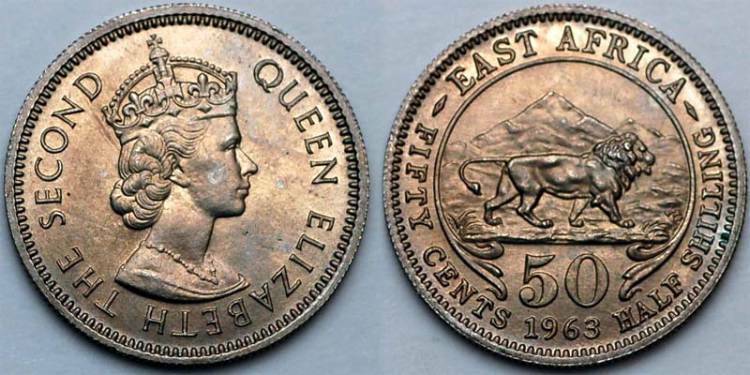 Five Cent coin again with definitive hole, Her Royal Highness Queen Elizabeth II immediately after ascending the throne of her father and thus inherting the tusks. 1 FLORIN (Nyaikūndū) 1920- 1921. 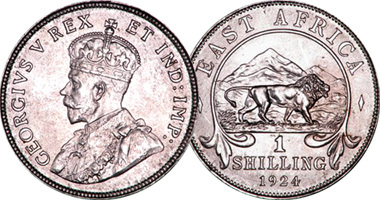 A short lived idea for an East African one hundred cents that was replaced by the Shilling in keeping with the British Standard Shilling of One hundred cents. 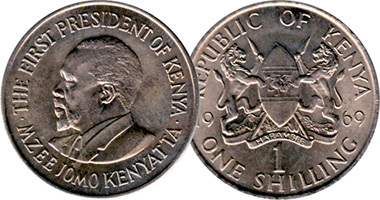 1 SHILLING (Chiringi) 1921 – 1952. 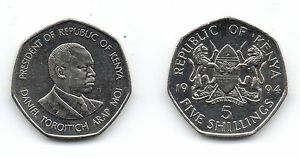 Post colonial issue 1966 – 2005 and still in circulation. 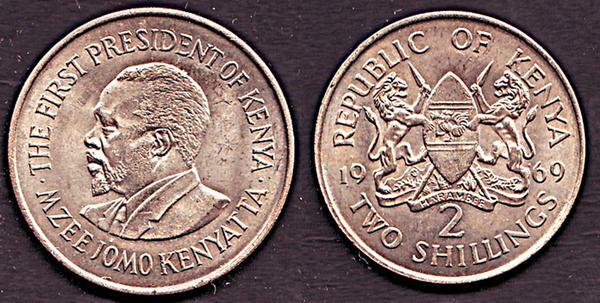 2 SHILLINGS (Rūbiya) A surprising re-introduction of the Rupee by the post-colonial government whereas the Protectorate and Colonial administration had dropped it when they took over from the IBEA Company. No longer in circulation. 5 SHILLINGS (Kīng’ori) From 1973. 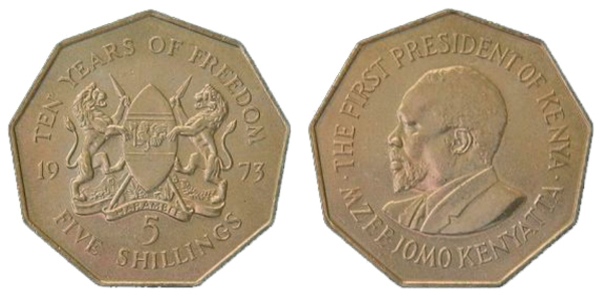 There has been several versions of this post-colonial coin The Kenyatta coin was to commemorate ten years of Kenyan independence and Kenyatta being first a Gīkūyū at heart before being an heir to King’i Njonji on the face of the coin, had this unique counting problem of not being exact, so the coin was nine sided representing ten years, kenda mūiyūru. 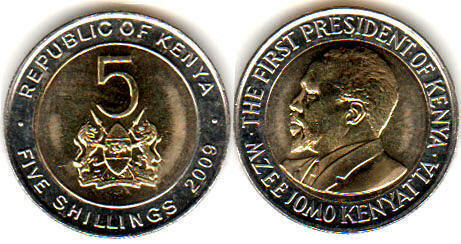 40 SHILLINGS (Kīrucī) 2003 Popularly known as “The big Lucy” in honour of the then First Lady, Maitū Lucy Kībakī though it donned the portrait of the President. A very informative piece of work..keep up Mukuyu. Great article. It was more interesting for me because I have most of the coins mentioned.